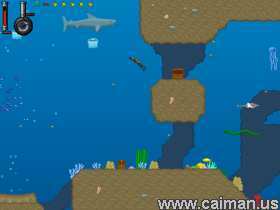 Caiman free games: Treasure Dive by H Unit - Helix games inc. 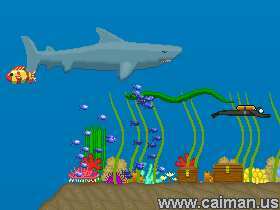 In the game you control a diver. There is a tutorial section that you can play in the game. Some of the fish are lethal to you. If you touch them you'll lose all your oxygen and have to restart the level. You also have to restart if you run out of oxygen. To restore your oxygen, swim to the surface or to an oxygen source (a big stream of bubbles coming from the ground). An oxygen source will push you up and give you oxygen at the same time, so be careful there aren't any lethal fish above you. In order to proceed to the next level you must find all the treasures in the level and swim to the surface. You find them in big chests that are locked with different-coloured locks. To open a lock of certain color, you must acquire a key of the same collor from a small chest. You don't need locks for small chests.